See How I Resisted a Horse Pun? I hadn’t been on a horse since I was eight years old, at Campfire Camp, where we had probably received two hours of lessons before we even mounted. The walk into Tayrona National Park had been billed as one hour by foot. How long it would take on horses was anyone’s guess, but it would have been impossible to bring our suitcases if we had walked. As I lurched up and down and back and forth on my horse, I tried to recall those horse riding lessons as Lynn screamed behind me. Not to get too graphic, but I had to firmly lay my left arm across my bosom to prevent giving myself two black eyes as the horse pitched up and down. God help any woman with double DDs. “Let me down this moment! Stop hitting the horse, you awful man!” Lynn kept repeating. “Hie, hie!” was his response, as he urged one horse, then another, onward. I’m sure he was as eager as we were for this to be over. I was a terrible friend. I started to laugh. I tried to do it silently, but thought it a good idea to yell back to Lynn, “This is the craziest ride I’ve ever been on!” so she would think I was laughing at the situation, not her. I haven’t laughed that hard since Lynn ran over the boulder in Cornwall. “Stop right now—I demand you stop this horse right now!” Lynn shouted. I knew she was terrified. “Try to stay relaxed,” I yelled over my shoulder as my horse suddenly jerked over to one side going over a hill of bowling ball sized rocks. “Don’t tense up!” I had read somewhere, maybe in Black Beauty when I was 10 years old, that horses can sense you are nervous and will take advantage of it by behaving badly. It was also advice I’d received in similar situations like a Jeep ride on a potholed road in Jamaica and a boat ride on the squalling sea in Italy—don’t tense up, it’ll make everything worse. While all this was going on, I kept seeing this scenario: One of my horse’s shoes would slip on a rock, his leg would fly out from under him and break, and I would hurtle onto a boulder or off a cliff. Then the guide would have to shoot the horse in front of us and I would have to crawl on my elbows the rest of the way with two broken legs. 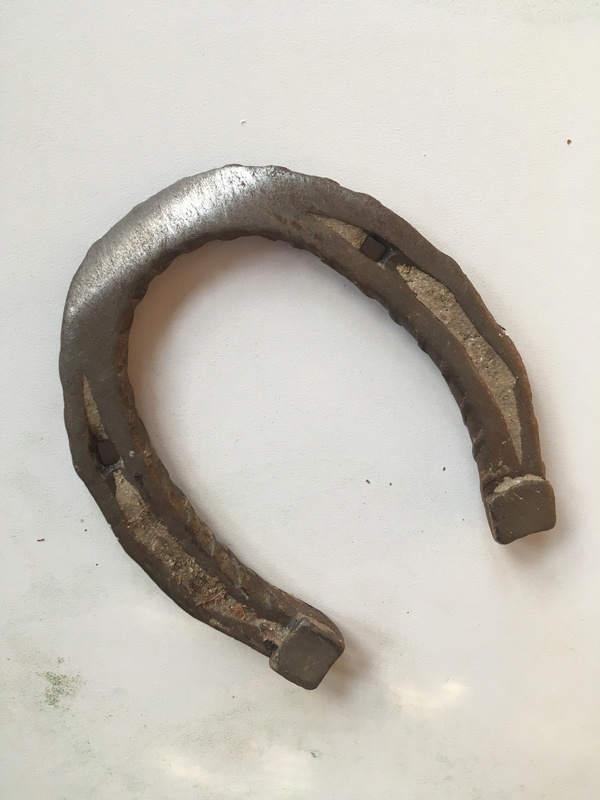 Several days later, I found a horseshoe on another path. Ignoring the airline rules about not transporting livestock items, I brought it home. It’s pretty much as worn and slippery as I assumed they all were. As I was imagining my future on permanent disability benefits, I also knew my horse had done this hundreds of times. He was not thrilled about it, because the horrid man had to keep urging him on, but it wasn’t his first time at the rodeo. Ha ha. “There’s a bridge!” I cried out to Lynn. “Bridge” is a very generous description. The riverlet was only about 15 feet wide but too deep to wade. Someone had laid rough-hewn planks across it. Lynn is not a fan of water. I heard her bargaining with the guide, who had slapped my horse so hard that it galloped headlong across the “bridge,” and on into the jungle. I don’t know what transpired behind me, but Lynn arrived at the lodgings shortly after me. We each tipped the guide something and he skedaddled. Did I mention it was 90F/32C, and 90% humidity? We were covered in sweat and dust. Lynn probably did stink at this point but I could no longer smell because my nose was clogged with dust. “Welcome to Tayrona!” A young man with braces came to greet us. There should be something called “The Braces Index” to measure countries’ economic development. Soon we were in our luxury hut, post showers, enjoying cold beers. 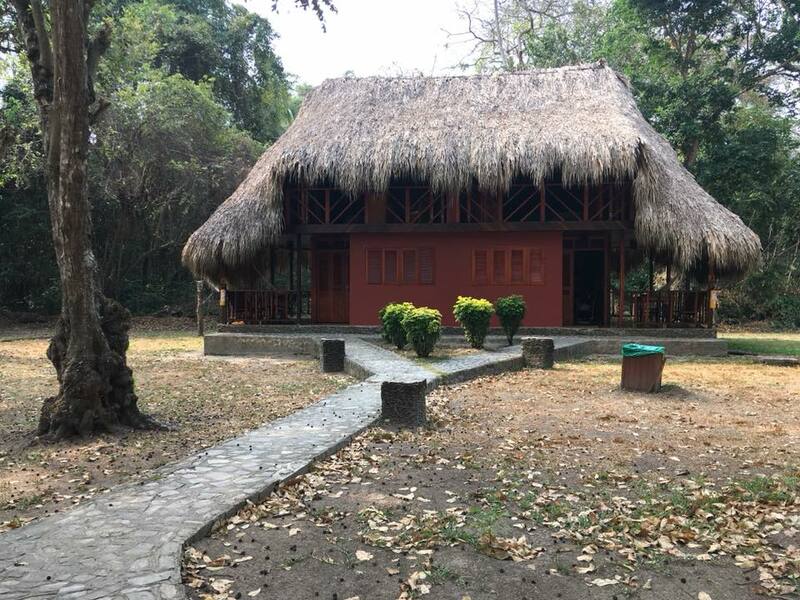 This entry was posted in Adventure, Animal Abuse, Budget travel, Culture shock, International Development, Travel and tagged Colombia, Tayrona National Park on May 4, 2018 by Breaking Free. I went back and forth with the driver in Spanglish, he explained the situation to his friend in the passenger seat in Spanish, and I tried to translate it to Lynn. Meanwhile I was also, mentally, pulling essential items out of my suitcase and stuffing them into a plastic bag to take with me into the park for the weekend. “You cannot take your luggage into the park,” he repeated for the umpteenth time. Finally, he phoned someone related to some tour company connected to Responsible Travel. He explained the situation to her, driving with his other hand, then turned and handed me the phone. The English of the woman I spoke with was about as good as my Spanish. I didn’t say it in exactly these words, but I made the point that we didn’t want to leave our luggage with someone we’d met 10 minutes ago, especially after the disappearing act of the driver in Medellin. Did I sound like Donald Trump, accusing Latin Americans of being criminals? I hope not. It seemed like a reasonable expectation, to go with what was stated in the itinerary. “Our bags aren’t even that big,” I said, and they weren’t. Lynn travels everywhere with a carry on, and magically, never smells bad. My bag was a bit larger. Whoever I was talking to on the phone had never been to the park. Lynn and I had never been. Our driver said he’d never been inside, only to the entrance. All of us were flying blind. The driver dropped his friend off in Calabazo, the last town before we reached the park. Then we drove on to the park entrance, where security guards stood watch over a closed gate. The driver turned and asked for our entrance voucher. Thankfully, for once I had read all the fine print when we’d paid for this trip and I had printed out the voucher. Oh dear. I have mixed feelings when people in other countries have an idealized notion of the US. I’m so cynical and disillusioned right now, so I guess it’s good to be reminded that other people think wonderful things about us. After exchanging a few pleasantries, I asked about the luggage. “No problem!” ruled the young man. I thought he and the driver would stand there and debate it for 20 minutes but no, the driver vanished, and our host waved over another guy leading three horses, who quickly strapped our luggage onto one of them. Somehow I had the presence of mind to throw my purse into my suitcase. I knew Lynn was sweating bullets. “I’ve never been on a horse before,” she pleaded. The guide had already helped me up onto a horse, then slapped its flanks and the flanks of the horse with the suitcases, and off we plunged into the jungle. “I’ll need some lessons,” I could hear Lynn behind me, then she let out a shriek as he slapped her horse and it began to run. The guide didn’t know any English and he must have been paid by the ride, not by the hour, so he pulled out his whip and started flogging the horses on. He wasn’t so much a horse whisperer as a horse whipper. The trail quickly turned into a boulder-strewn nightmare. Since I had packed my camera away, I have no photos from this episode but they would be blurs anyway. The path below is a tame version of what we did. Wherever we were was, literally, just piles of football-size rocks strewn along hills and valleys. I could hear Lynn behind me, screaming. “Stop! You horrid little man!” in a crisp English accent. I may have imagined the “horrid” part but her accent had suddenly become like the Queen’s, not her usual casual London. I wasn’t sure if she was furious about the horse being whipped, or terrified about being pitched headlong onto a boulder—both valid concerns. 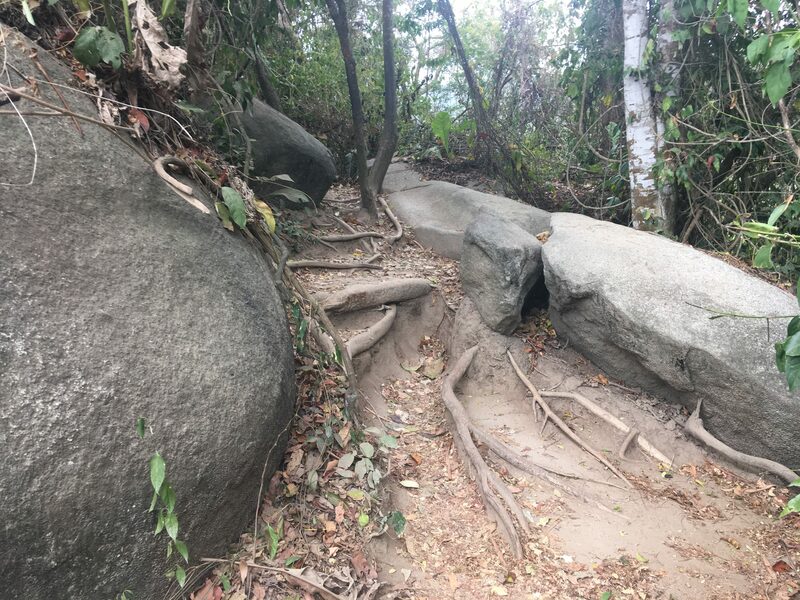 This entry was posted in Adventure, Animal Abuse, Budget travel, Culture shock, Travel and tagged Colombia, Tayrona National Park on May 2, 2018 by Breaking Free.